Derby’s beautiful 4-rail HDPE rail fencing system is perfect for horses, cattle and other livestock with tighter spacing between the rails. This is the ultimate all-purpose fencing solution for your farm, ranch or large property. The kinds of fences commonly used for animal and livestock containment include rail, various forms of galvanized and vinyl coated wire, electric and combinations of these. Whatever the fence is made of, it needs to be highly visible, resistant to damage by animals, durable, attractive and safe for contact by horses and livestock. Derby Fences are strong, durable, aesthetically beautiful, easy to clean, stain resistant and virtually maintenance free for years. The rails and posts are manufactured out of high-density polyethylene (HDPE) materials that will not shatter or split in extremely cold weather. Derby Fencing withstands temperatures as low as -60 degrees Fahrenheit, contains no arsenic or chlorides and will not contaminate water or soil. HDPE is also impermeable to acids found in animal wastes. Choosing the right fencing material for your particular project is a very important first step in researching horse fence products. There are both positives and negatives to many of the commonly available horse fence materials but ultimately, safe horse fences need to be flexible (bend or give) but not break, be highly visible, extremely durable and virtually maintenance free. Derby’s unique thick-walled construction makes our HDPE horse fences the sturdiest and safest of all polymer fences available on the market. Derby Fence is manufactured from High Density Polyethylene (HDPE horse fence) and will not become brittle even at 60 degrees below zero and will absorb the impact of a full extended leg kick from any breed of Equine or Bovine. Generally, land owners want the most durable horse fence they can afford. Derby Fences are strong, durable, aesthetically beautiful, easy to clean, stain resistant and virtually maintenance free for years. The rails and posts are manufactured out of high-density polyethylene (HDPE) materials that will not shatter or split in extremely cold weather. Derby Fencing withstands temperatures as low as -60 degrees Fahrenheit, contains no arsenic or chlorides and will not contaminate water or soil. HDPE is also impermeable to acids found in animal wastes. Fencing is an extremely important safety consideration for your farm, ranch or land. Ultimately, your budget is going to determine the type of horse fencing you choose for your project. The style and type of fence that you need will depend on several factors. A High Density Polyethylene (HDPE) Derby Fence is the right choice if you are looking for a safe, durable, and virtually maintenance free horse fence product that is the ultimate fencing solution for any location or climate. 4. 100% Made in the U.S.A.
All Derby Fencing is 100% American made by Lakeland Plastics in its Mundelein, Illinois facility utilizing state of the art extrusion calibrating equipment and CNC machining centers. Derby Fencing reclaims 100% of its scrap production, thereby contributing nothing to the areas landfills, and recycles all its cooling water striving to be as Eco friendly as possible. Your animals will be safe inside Derby’s HDPE horse fence products and you will be choosing an environmentally friendly fencing option. The type of fence that you will need depends on the livestock, crops, and other vegetation that border the fence. Horses will run through a fence or get tangled in it causing harm to themselves. Cattle will crawl over fences, sheep try to crawl under. Hogs, of course, try to root their way under a fence. Any livestock will put a fence to its greatest test when there is a lush green crop on the opposite side. Derby’s beautiful four rail HDPE rail fence system is perfect for horses, cattle and other livestock with tighter spacing between the rails. This is the ultimate all purpose equine ranch fencing. The main purpose of a four rail HDPE farm fence is to eliminate a foal from rolling under the bottom rail and for stallion containment. Some breeds of Stallions might need to be contained behind a five or six rail fence and Derby Fence has you covered. 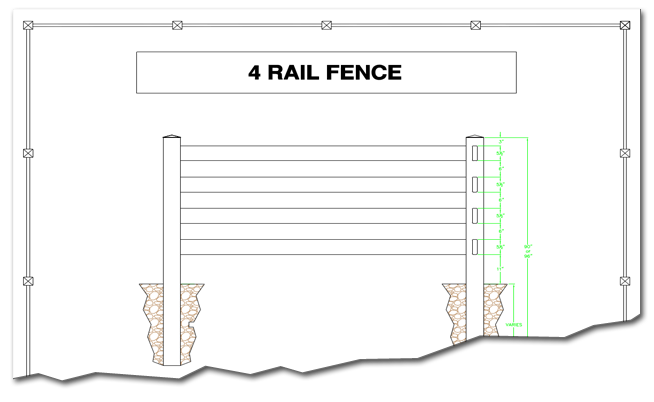 As one of the top manufacturers of HDPE rail fencing, we can create a custom design and height to please the toughest critic. Livestock put a lot of pressure on fences and it’s always a good idea to use a hot wire system to keep them off the fence. It doesn’t harm them it teaches them to respect the fence line. Derby Fence is manufactured in typical lumber sizes. Because Derby fence is hollow it is lighter and easier to work with than wood fencing. An HDPE rail weighs about as much as a wooden rail of the same dimensions, and a post weighs about one quarter as much as solid wood of the same dimensions. Thick side walls add strength and firmness to HDPE fence products and eliminate the need for, and cost of, internal reinforcement with other materials. Along with maintaining a traditional fence appearance, this traditional sizing enables easy replacement of traditional wooden fence components when needed. Posts are 6″ x 6″ and weigh almost twice that of a standard PVC post. There are many environmental problems associated with PVC fencing. PVC can also be difficult to recycle. The HDPE that Derby Fence uses is inherently safe to the environment. Because Derby Fence uses nothing but UV stable HDPE, Derby Fence can easily be recycled at the end of its’ useful life. Your animals will be safe inside Derby Fence HDPE fences and you will be choosing an environmentally friendly fencing option. Our fencing is safe for containing all types of livestock and pets. Derby Fence will not splinter or cause injuries. Derby Fence is one of the toughest plastic horse fencing solutions on the market. The posts and rails have twice the wall thickness of most PVC fencing. Our posts weigh approximately twice that of a standard PVC Post. Derby Fence is made to withstand years of abuse from the elements and your horses. 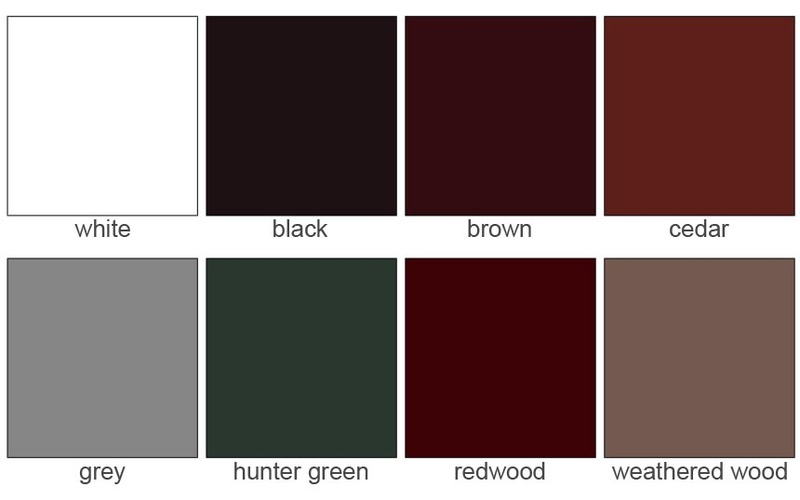 View details on fence types offered, dimensions and fence installation instructions below. Derby Fence is the right choice when looking for a fence that is safe for the animals, people and the environment. Derby Fence is the nation’s leading provider of High Density Polyethylene (HDPE) Fencing products for animal containment, equine and livestock.